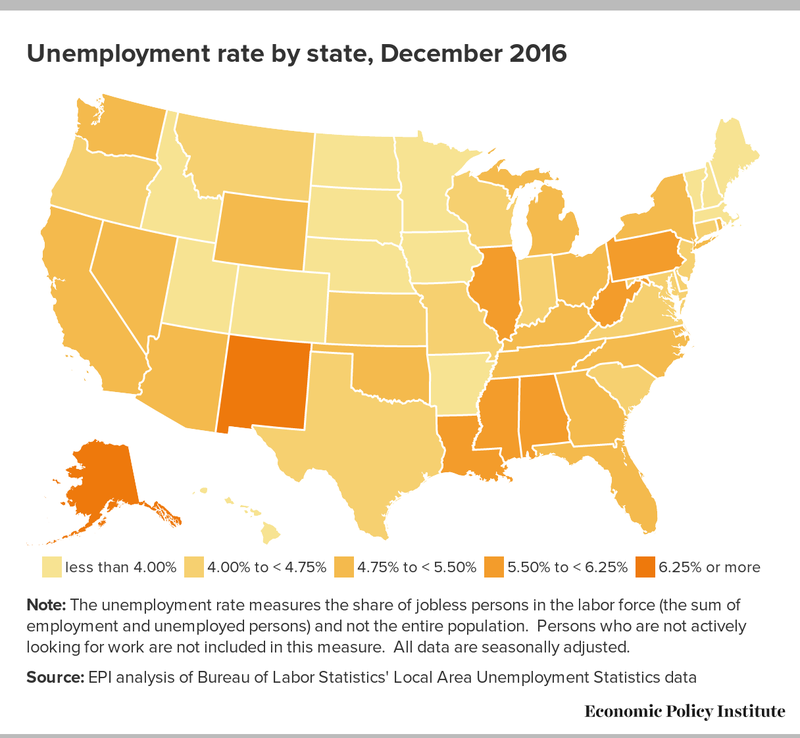 The December state employment and unemployment data, released today by the Bureau of Labor Statistics, showed that most states ended 2016 in relatively good health. 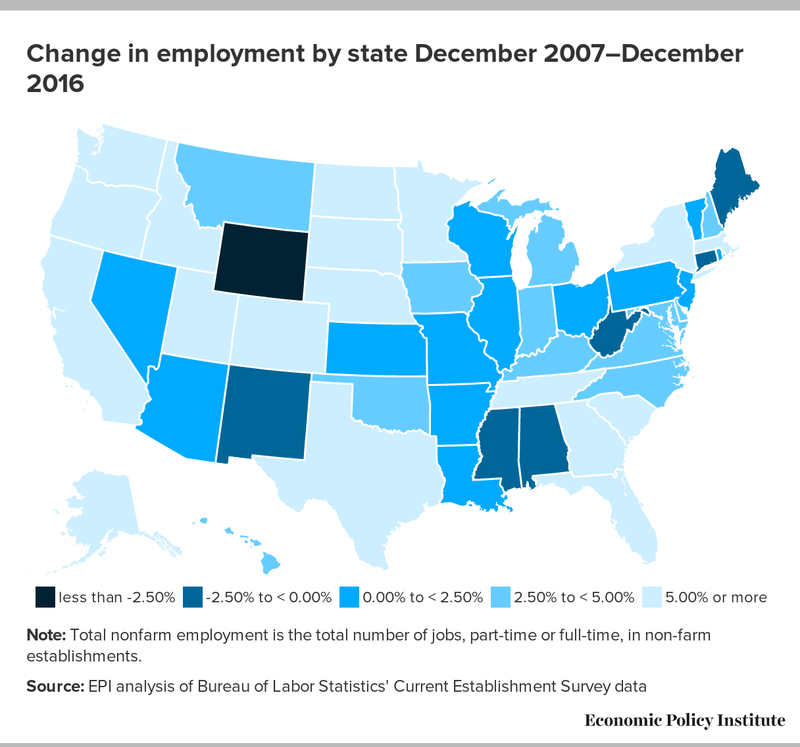 A full nine years later, only seven states still had fewer jobs than prior to the start of the Great Recession, and unemployment rates in all but a handful of states are lower than or within striking distance of their pre-recession values. From September to December of last year, 35 states and the District of Columbia added jobs, with New Mexico (0.9 percent), Oregon (0.8 percent), Georgia (0.7 percent), Idaho (0.7 percent), and Montana (0.7 percent) making the largest percentage job gains. Over that same period, employment fell in 15 states. Of those states, North Dakota (-1.0 percent), Alaska (-0.8 percent), Delaware (-0.7 percent), and Mississippi (-0.7 percent) had the largest percentage losses. Over the final three months of 2016, the unemployment rate fell in 37 states and the District of Columbia. Connecticut (-1.0 percentage points), Oregon (-0.9 percentage points), Massachusetts (-0.8 percentage points), and Missouri (-0.7 percentage points) experienced the biggest drops in unemployment. Unemployment rose in 11 states, although most of these increases corresponded to relatively large increases in state labor forces—suggesting that at least some of these unemployment increases were the result of previously discouraged workers restarting the job search. The largest unemployment rate increases occurred in Alabama (0.8 percentage points), Michigan (0.4 percentage points), and North Carolina (0.4 percentage points). In these states, the labor force grew by 1.7 percent, 1.4 percent, and 2 percent, respectively, while the national labor force number was largely unchanged over this period. While the country has made great strides since the recession began, there remains a significant number of “missing” and underutilized workers that would benefit from further tightening of the labor market. Because the Federal Reserve has opted to temper job growth by raising interest rates, the task of stimulating stronger job growth will fall primarily to lawmakers willing to invest in those communities that need a boost. State lawmakers need to keep this in mind as they enter into budget season.